2 Websters Yard01263 715779work01603 870304fax Self-cateringThis 17th century flint and brick cottage has been fully renovated, making it a comfortable stay for holidaymakers. Nature emanates from every corner of this area of Norfolk; from the beautiful salt marshes and sandy beaches of the coast to Syderstone Common, which has claimed a Site of Special Scientific Interest for its Natterjack toads. Not only is this property great as a base for exploring the marvels of the natural world, it also is close to many historic houses, country parks and windmills which help to provide great days out. • Outdoors: Rear shingle area with bench. Separate garden with furniture. This brick and flint cottage, parts of which date back to the 17th century, has been sympathetically renovated and provides pleasant and comfortable accommodation which is full of character with beamed ceilings. 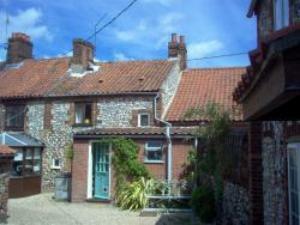 This 17th century flint and brick cottage has been fully renovated, making it a comfortable stay for holidaymakers. Nature emanates from every corner of this area of Norfolk; from the beautiful salt marshes and sandy beaches of the coast to Syderstone Common, which has claimed a Site of Special Scientific Interest for its Natterjack toads. Not only is this property great as a base for exploring the marvels of the natural world, it also is close to many historic houses, country parks and windmills which help to provide great days out.